A lumbar puncture is also referred to as a spinal tap. It is a diagnostic procedure that is performed in order to obtain a sample of CSF which is then sent for testing. CSF (cerebrospinal fluid) is a clear, colorless fluid that surrounds the brain and spinal cord. At times an LP is a therapeutic procedure involving the administration of medication into the CSF. Who performs a lumbar puncture? An LP is performed by qualified physicians from various specialties who are skilled in this procedure. Although an LP is often performed acutely in a hospital setting (emergency room, intensive care unit or general ward), it is also frequently performed on an out patient basis either in your physician’s office or as a same day procedure in a hospital. To administer medications intra-thecally (into the CSF). You will be asked to lie on your side on a hospital bed or examination table with your chin tucked down towards your chest and your knees pulled up towards your belly (simulating the fetal position). Less commonly an LP may be performed in the sitting position. The procedure is performed in a sterile manner. Your physician will use an antiseptic solution to cleanse the lower part of your back and will then drape the area in preparation for the procedure. Using a small needle, a local anesthetic will be injected into the skin at the lumbar region in order to numb the area for the procedure. This may sting or burn a little for several seconds before the area is numb. A hollow needle will then be inserted through the anesthetized skin, between two vertebrae, into the subarachnoid space where the CSF is located. The opening pressure is measured using a manometer and the fluid is collected and sent for analysis. It is important to remain absolutely still during the procedure. When the procedure is completed, the needle is withdrawn and a small bandage is placed over the puncture site. The entire procedure usually takes 20 – 30 minutes. It is sometimes difficult to obtain CSF due to your physician’s inability to reach the subarachnoid space (where the CSF is located). This is especially so if you are very obese, pregnant, have prominent degenerative changes in your lumbar spine, have had low back surgery or suffer from scoliosis (abnormal curvature of the spine). Getting into the above described position and maintaining this position during the procedure best enables your physician to successfully complete the procedure. If, for any reason, the procedure is not successful, it can then be attempted in the radiology department under X-ray guidance. This is a slightly uncomfortable procedure. You will feel a pressure-like sensation as the spinal needle is inserted through the numb area. Some may experience a painful sensation in the back as the needle is pushed in. If you feel pain shooting into your legs or feet, you need to notify your physician so he may adjust the direction of insertion of the needle. Many people who undergo this procedure admit that it does hurt but not much more than a blood draw. There is a risk of infection. Any time a foreign object (the LP needle) is introduced into the body, there is a risk of infection. Since the procedure is performed in a sterile manner under aseptic conditions the risk is minimal. If there is evidence of skin infection at the proposed site for the LP, the procedure is usually deferred or performed at another site. There is a risk of hemorrhage (bleeding). Anytime a needle penetrates the skin there is a risk of bleeding. This is minimal given that there are no major blood vessels in the area. Small blood vessels may be penetrated by the needle and do not usually result in any complications. 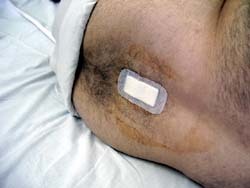 Simple pressure on the area for a brief period of time usually stops the bleeding. You need to inform your physician if you have a bleeding tendency or you are on blood thinners such as warfarin, heparin, low molecular weight heparin, aspirin, clopidogrel or others. The lower back area may feel bruised or soar for a few days after the procedure. This is self limiting. The most common complication is headache. Less than 1% of patients develop a headache immediately after the procedure. More commonly you may experience a headache within 24 to 48 hours after the procedure. This occurs in a minority of patients and usually responds to bed-rest, hydration and simple analgesics. If the headache is severe or does not respond to these measures, contact your physician. If an LP is being performed for therapeutic purposes and medications are administered intra-thecally (into the CSF space), there is a small risk of nerve damage, numbness or paralysis that is otherwise exceedingly rare. Other complications can be avoided by ensuring that a funduscopic examination is performed to screen for increased intracranial pressure and in some cases a CT of the brain may be performed beforehand. You may be asked by your physician to remain flat on your back for a period ranging from a few minutes to several hours. You will be asked to maintain good hydration by drinking additional amounts of fluids in order to reduce the probability of developing a headache. Avoid strenuous physical activity for 24 hours after the procedure. You may return to your regular activities immediately after the procedure. Notify your physician if you develop any numbness, weakness or bowel or bladder dysfunction following the procedure. Notify your physician if you develop a severe headache that does not respond to simple painkillers.